Tackling society’s trickiest problems can require some serious innovation. NewLink Wales is a charity that supports people affected by wellbeing issues such as psychological trauma, anxiety, mental health problems, substance misuse and wider social issues – and their team have enlisted some unusual allies. The eight beehives at NewLink Wales’ head office are the perfect community setting for people to put skills they’ve learned in treatment and support into practice. It’s part of the charity’s Buzzin project, which takes a creative, nature-based approach to helping people achieve wellbeing and solidify recovery. 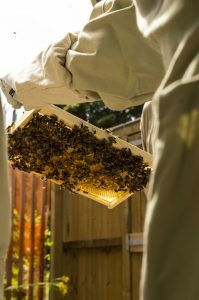 ‘Working with our bees gives people the opportunity to take everything they’ve learned in theory, and put it into actual use,’ says Lindsay Cordery-Bruce, CEO. ‘We train them how to prepare and stay calm around bees, so that they can face a calculated risk. 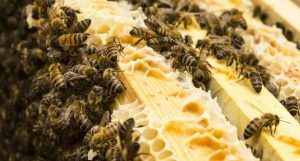 ‘The course teaches essential team communication skills, and the chance to get hands-on with practical tasks like hive building. 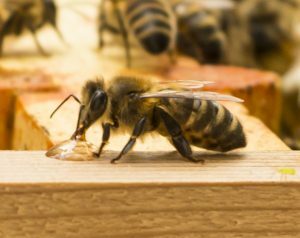 Bee-keeping is on the rise as awareness grows of the environmental plights these incredible creatures face. It’s not just people the project’s helping – these increasingly at-risk natural wonders benefit too. ‘Every time I take part in this project I feel more comfortable and confident in my skillset. I turn up and meet new people, which used to be something that could make me anxious.’ – Buzzin participant. ‘We’ve partnered with Nature’s Little Helpers, who’ve supported the project from the beginning,’ Lindsay explains. ‘The bees are thriving so much we’re expecting our first batch of honey this August! ‘With Nature’s Little Helpers on board, we’ll be developing our social enterprise. This means service users can be a part of making our own products, such as honey, soap, and lip balms. ‘We’ve seen the difference it’s made to our service users, and we think as many people as possible should be able to experience the wellbeing benefits of working with nature to help bees. We’ll soon be offering beekeeping experience days, which are a fantastic gift for bee fans. Buzzin’s not just for people who need NewLink Wales’ support – many involved are just keen to help the bees. NewLink Wales is a Cardiff-based wellbeing charity that helps people get their lives back on track by supporting them to change behaviours and lifestyles that affect their health and wellbeing. NewLink Wales strives to enable people to achieve wellbeing and to move on from problems that have held them back, including substance misuse, confidence issues, psychological trauma, mental health issues, offending behaviour and a range of other social problems. NewLink Wales offers post-recovery courses for individuals affected by situations that have damaged their long-term wellbeing, such as substance misuse. The organisation also provides a large amount of training for professionals that work within the substance misuse and wellbeing sectors.